Late last week my Stampin' Up!® Upline Sharlene Meyer had a card on her blog that she'd made using the leftovers from an earlier Scrapbook Layout that she'd created. 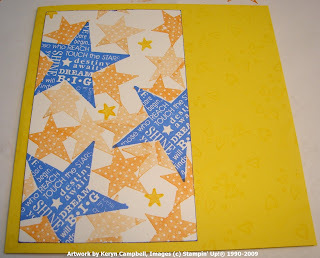 Aha I thought what a great way to have cards on hand, what a great way to use scraps and what a creative way to tidy up and also what a great tutorial for Stampin' Scrap. Here is the LO that I created first. I used sketch no. 28 from 'The Little Shop of Sketches'. Other - Paper Cutter, Snail Adhesive, Cotton Balls. I was then left with the leftovers sitting on my desk. Obviously I had to add something to replace the 12x12 Yoyo Yellow card and a main image to replace my photo. I replaced the yoyo yellow 12x12 with a yoyo yellow 14cm sq card blank and added a stamp set, ink pad, cardstock and a marker to create to create a central image. Starting with the 14cmx14cm card blank I used the heart background stamp from the Sprinkles set and repeatly stamped it to cover the card using Versamark Ink, creating a watermark background. 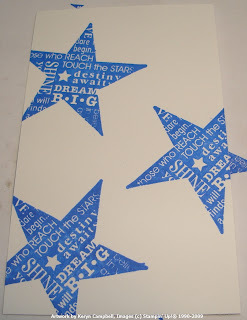 Then taking whisper white cardstock cut to 13x8cms for my main image I stamped the largest star from 'In the Stars' stamp set in brilliant blue ink. 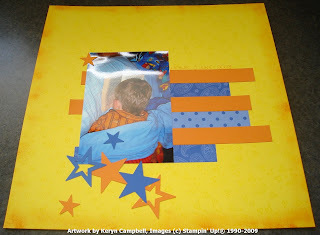 The large star was again stamped this time on a post it note, making sure that one part of the image had the adhesive on the back. 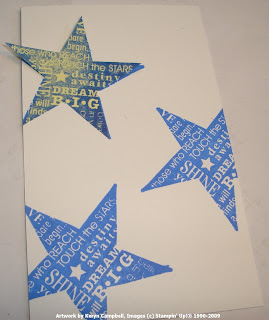 Cut out the star just inside the lines and place it over the first stamped star. 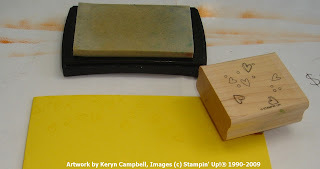 While the image is covered stamp around it and over it with a smaller star in Pumpkin Pie ink using second and third impressions. By this I mean ink your stamp and stamp once on scrap paper and then stamp the second and third times on the card. When you've stamped around the first star, move your post it note mask to the next image and repeat. 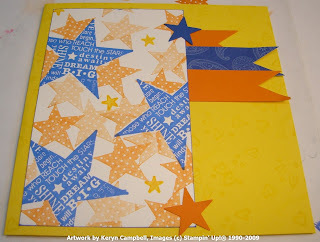 I felt looking at the star images sitting on the yellow card blank that it needed a small amount of yellow to tie the two together so stamped a smaller star in the gaps using a Summer Sun Stampin' Write Marker. I then edged the whisper white card by running it through the brilliant blue ink pad. 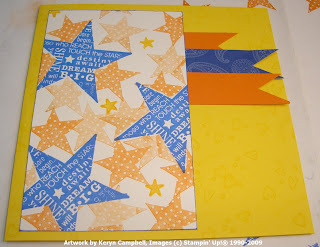 Using the leftover strips of pumpkin pie cardstock and brilliant blue dsp from the LO snip three of them shorter and cut a triangle in one end. Place them as shown in the photo above. Adhere to the base card and adhere the whisper white cardstock over the top. 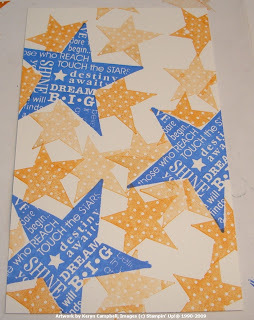 Punch a couple of small stars from left over cardstock and attach to the card as a finishing touch. You could add a greeting with a stamp or rub on to the bottom right hand corner if you wished. Now tidy up a little less than you had before. This is a great way to use scraps....I never had the heart to throw away all my leftover scraps. I liked the way you edged the paper by running it through the ink pad.